Posted on August 22, 2016 by Megan V.
Let’s say that you’re a doctor. You have a choice to save either one of these patients: a ten year old boy who arrived at the hospital first, or the mayor of the city. You can only save one while the other will die. Who will you choose? Now, let’s say that you choose the child: congratulations, you have now unleashed a monster onto the world. Dr. Kenzou Tenma, a Japanese doctor working in late 20th century East Germany, saved a ten year old boy named Johan Liebert instead of the mayor ten years ago. Because of that, he lost his trust with his colleagues, his fiancee, and his promotion. To top it off, the boy he saved had murdered two people before admitted to the hospital. Now, Dr. Tenma is a fugitive framed for the murders committed by Johan Liebert after seeing this monster again. Throughout his run on his life, Tenma tries to figure out Johan’s past. And he must consider one question: if he knew ten years ago that the boy he wants to save will turn out to be a monster, would he save the mayor? And if Johan’s life were in his hands again, would he save him? This manga is a very good psychological story. Dr. Tenma meets a bunch of so-called monsters along his run, and proves that all of them can be forgiven. For example, he meets a soldier and a young girl. The soldier had killed the girl’s mother, and worries that he would never be forgiven, as the girl never smiles or speaks to him. However, Dr. Tenma fixes this rift, and in the end the little girl holds the soldier’s hand as if he were her father. Additionally, we hear the police’s side of the story, and through their investigations even we start to wonder if Johan is just in Tenma’s brain or not. Additionally, Urasawa accurately depicts the historical content and geography of East Germany and Czechoslovakia throughout the story: the beautiful city of Prague, the slums of major cities, and the brutality of the underground. 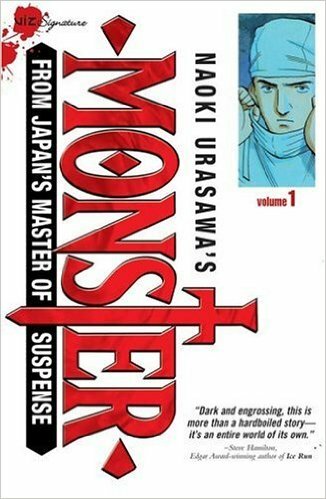 Urasawa’s characters are also incredible, and it is amazing what each of them does to get the job done: Johan’s insane plans, the detective that is chasing after Dr Tenma and what he thinks in order to chase after his patients, and the motivation of many, whether if it is chasing after Johan or living a daily life. The artwork is very beautiful, and you cannot tell it’s a manga from twenty years ago: each of the characters looks widely unique and well crafted. Additionally, the backgrounds are incredible, which each scene looking realistic as if you were there yourself, whether it was in a hospital room, a restaurant, or a prison. This was a manga that made me just say “wow” at the end, and anyone into mysteries, action, psychological thrillers, or horror would be really hooked into this series. This entry was posted in Book Reviews, Manga Reviews and tagged doctors, manga, murder mystery, psychological thriller by Megan V.. Bookmark the permalink. I’ve heard a lot of great things about Monster, and I kick myself everytime I read something else about it for not having gone out and read or watched it myself. Everything about it just seems insanely intriguing. I’ll definitely have to knock that one off of my to-do list soon. Great review!